I have certain pictures, like this one, that I think of as “old master” style. They are painterly still lifes set again rich, inky black backgrounds, with a certain quality of light that recall the 17th-century Dutch masters. Paintings inspire so much of my photography. 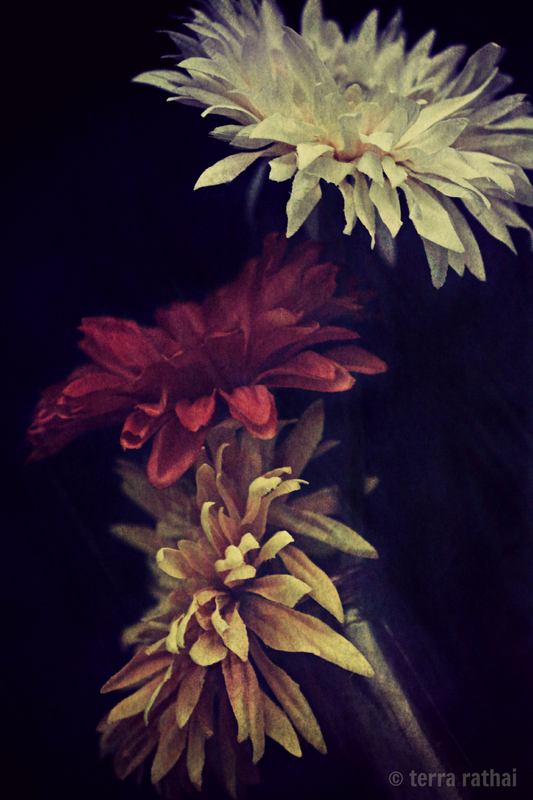 Posted on August 5, 2013 by Terra Rathai	This entry was posted in 365 Project - 2013, ART, Flora, flowers, PHOTOGRAPHY, still life and tagged ART, Dutch masters, Flora, flowers, old master, painting, Photography, Project 365, silk flowers, still life. Bookmark the permalink. Wonderful lighting! Love the mystery, dramatic lighting.